Taste test: I'm not big on monterery pepper jack as a cheese gourmet, so am unclear about whether these actually taste like that flavor of cheese. However, there is a slight pepper kick to it, kind of like a jalapeno pepper, without all the heat associated with it. The chips themselves are standard Lay's, so they're not extremely greasy or extremely dry, they don't overpower the powder. Just enough spice to leave some heat aftertaste, this would be a good "starter chip" for someone who wanted to enjoy hot chips without having to race for a glass of water. 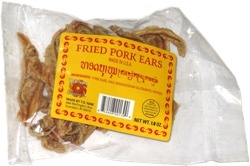 Smell test: There's an aroma there but I can't place it. Slighty cheesy? 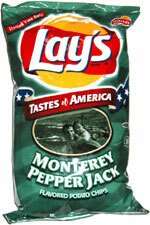 Trivia: Go to www.lays.com to vote for the next two flavors in Lay's "Taste of America" brand.